Hotshoe Hot Rods | 417-466-0288 | Street Rod Chassis | Street Rod Frames | Chassis Parts and Components - Home of Hotshoe Hot Rods. Building Quality Street Rod Chassis and Chassis Parts Hotshoe Hot Rods building street rod chassis for the top builders in the country. Hotshoe Hot Rods, Street Rod Chassis, Model A Chassis, 32 Ford Chassis, Willy's Chassis, 35 - 40 Chassis, formerly LRS, Inc.
Hotshoe Hot Rods (HHR), is a full service Hot Rod Shop, building quality Street Rod Chassis with fixtures made to exact specifications for the last 20 years. HHR builds Suspension Parts, Frame Rails, Rolling Chassis, or a turn key hot rod, depending on what your needs are. Check out the SUPER SPECIAL below! 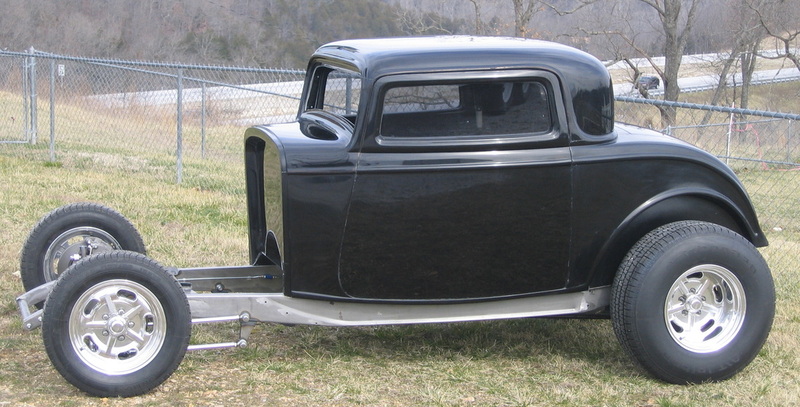 Click on the link below to see our rail and street rod chassis pricing. 32 Ford Chassis & Body Description: Complete with rolling chassis with dropped tube or I beam axle. The body includes hand laid fiberglass using ISO thermal tooling resin, complete floor and transmission tunnel, dash installed, doors and trunk lid hung and latched, hidden door hinges, bearclaw door latches, Lokar trunk lid release cable installed, aluminum trunk hinges. Power windows installed, all glass included, wood kit installed, steel reinforced inner structure on coupe body. Fender and hood packages are also available. ​Give us a call at 417-466-0288 to order yours for the upcoming car show season! Hotshoe Hot Rods is a Sponsor for Shades of the past 2018 Give Away Car! Go to the Shades of the Past website for more information about the give away. HHR is a dealer for the following. Call us at 417-466-0288 or go to Contact Page for pricing on any of their products. For more, see our pages under CHASSIS. In need of just a set of rails, check out pricing under CHASSIS section. All of our product is manufactured in the USA. Check out our Chassis Section for Parts, Rails to Rolling Chassis. Authorized Dealer for Pete & Jakes, Heidt's Automotive, Classic Instruments, John's Industries, American Stamping Corporation and Speedway.